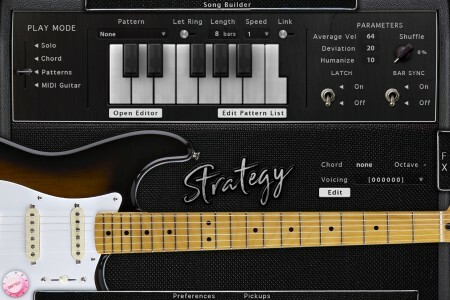 The “Strategy Guitar” library is based on a Fender© Stratocaster© electric guitar. This guitar has been used by countless musicians for over 60 years and is still one of the most sought after guitar instruments. Its stunning sound is suitable for many styles of music including Rock, Pop, Funk, Country, Underscore and much more! One Of The Most Sought After Guitar Instruments Ever! The Fender© Stratocaster© electric guitar sampled for this library features 3 single coil pickups (bridge, middle and neck) that give it a very unique and tweakable tone. We were able to sample all three pickups separately and give access not only to the 5 positions available on the real instrument, but you can also control each volume separately and even mix the 3. It comes with a set of 10 very realistic effects and 8 different amps modelled after most of the best guitar amps on which you can choose exactly how you set the microphones, providing you with all the necessary tools to shape its sound exactly like you want. 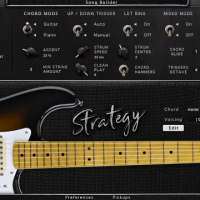 It features Acoustic Samples’ powerful strum engine, pattern maker and song builder available in their other guitar libraries like the Sunbird or the GD-6, making the Strategy library the perfect tool to create accompaniments or solos. This library has been sampled very deeply, all frets of all strings with upstrokes, downstrokes, round robins, releases, staccatos, mutes, palm mutes, hand blocks, slides, hammer ons, pull offs, retriggers, fretnoises and other articulations. 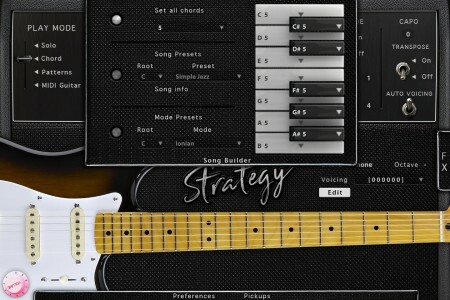 All of this detail allows you to reproduce the real playing of a guitar player, and easily. There are basically 4 modes, the solo mode that allows you to play melodies, the chord mode that helps playing strums or picking, the patterns mode that does all of the strumming or picking for you and the MIDI mode that allows you to use your preferred midi guitar controller. 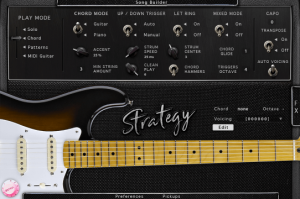 It is a huge 10.61GB Fender© Stratocaster© electric guitar library built for the UVI Workstation (free). Strategy can strum in various ways, up, down, muted, in legato and allows finger picking. 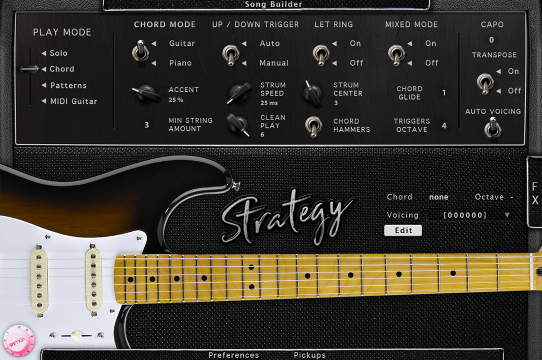 Everything is modeled after meticulously analyzing thousands of real chords played on guitar. Every aspect of the strumming engine can be tweaked to achieve the sound you want. The chord recognition engine helps convert any chord you play on your keyboard to a real guitar voicing. Recognizing a chord is made through a database of thousands of standard chords, and you can edit every chord or even add new ones. The chord hammers feature lets you play left hand hammer ons and pull offs while strumming or picking. The Guitar mode that separates the notes selection from the triggers. So pressing a chord with the left hand only makes the soft sounds that your left hand would make on a real guitar and you need to trigger the chords or the single strings with the right hand. The Piano mode will trigger the chords as soon as you press a chord, the upstrokes and downstrokes are automatic depending on the position in the current bar. When you play a chord on your keyboard, our engine will recognize it and display its name and the current voicing on the small panel above the neck on the interface. You can assign any voicing to it using the voicing menu. Click here for more details in the user guide. The patterns mode is very similar to the chord mode, the chord recognition engine works the same way, but this time the triggers are not simple strums anymore. They are a set of patterns that you can loop, adapt to the tempo or the metrics, change the velocity in real time using a controller, synch to your host, and add groove to. You can choose from a large selection of patterns or create your own using the pattern maker and assign them to each trigger key to create a full song in a few clicks. You can assign 13 different patterns of your choice to 13 different notes. Clicking on one of the keys on the interface will launch the pattern, triggering another one will stop the first one and start the new one. You can also trigger the patterns from the keyboard using the notes from C4 to C5. By default releasing the keys will stop the pattern. The velocity at which you press the key will determine the velocity of the whole pattern. You can now delete any pattern from the list by clicking on Edit pattern list which will open a small window in which you will be able to select any pattern and delete it. 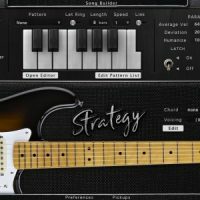 Creating realistic guitar patterns has never been easier. 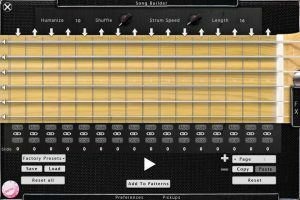 You can create strumming, picking, or finger picking patterns in seconds and even make them of an infinite size. We even made the sharing of these patterns easy, just save them and send them to other users, the database can only grow! 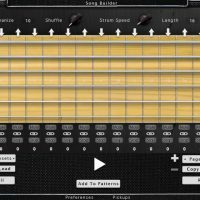 The Pattern Maker is an improved step sequencer made especially for guitar strumming. Each fret represents a quarter note and you can either add a whole chord or just a single string (if the link icon is unselected). If multiple events are in the same step, they will be strummed following our strum engine parameters. You can create as many pattern pages as you want, giving you access to many variations by just pressing one key. Of course you can copy the content of one page and paste it on another to make slight variations, reset a page or the whole pattern. The size of the patterns is virtually infinite. You can also import the factory presets and modify them as you want, save your patterns to your HD, load them and preview or add them to the pattern list. Once you click the “Add to pattern” button, the pattern you created will appear at the bottom of the patterns list in the pattern panel and you will be able to use it on one of the 13 keys. The song builder panel is the feature that will let you compose songs extremely quickly. Sometimes playing a series of chords can be complicated, especially if you are not an advanced keyboardist. 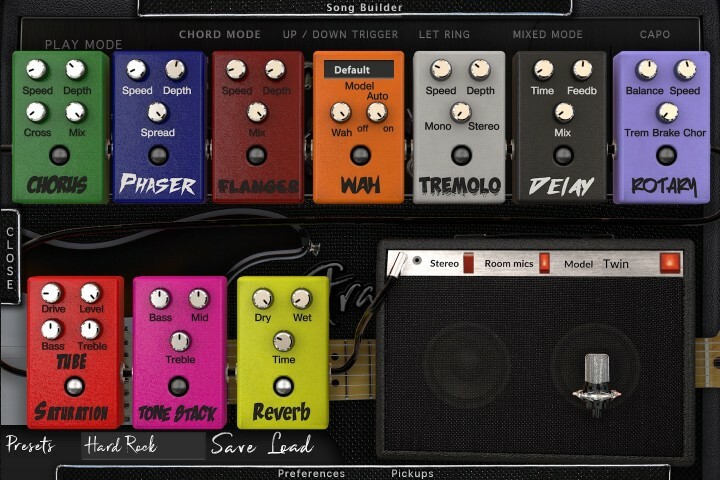 The song builder allows you to decide which chord will be triggered when selecting only one note. 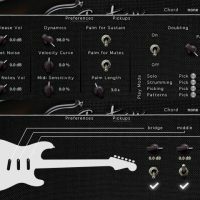 Included are a selection of presets to give song ideas, chord progressions, modes or chord types. Combine this with the patterns and pressing two keys at the same time is enough to play a song. 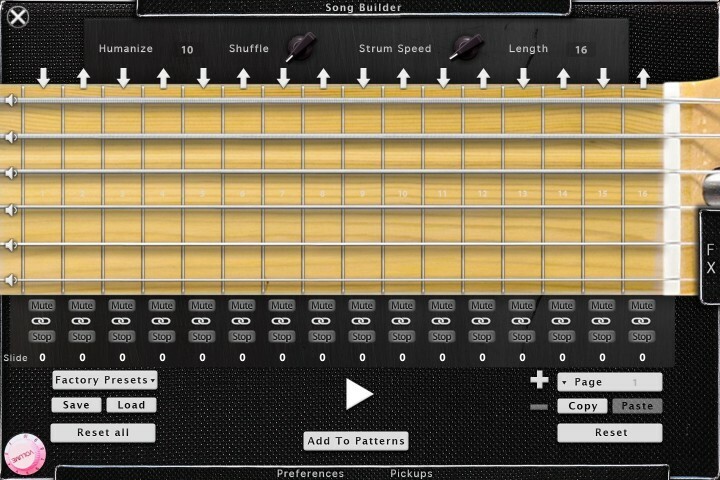 The song builder is available in chord mode or in patterns mode. You can use set all chords using the first menu, it will set the same chord to all of the 12 notes. The song presets are a set of predefined songs with the right chord progressions, you can change the root if needed and the progression is detailed under song info. The mode presets is a list of most music modes and their corresponding chord progressions, you can change the root if needed. You can also do this manually, on the keys, you can change the type of each chord along with it’s root. So it makes it easy to play songs that have different chords for the same root note. When selecting one of the presets, some keys will appear in red and the corresponding chord will be a “5th”. This means that there is no “valid” chord for this note in the selected song or scale. You can of course set each chord manually by clicking on them and selecting it’s kind, even starting from a preset. Play Melodies With Automatic Hand Position & Tweak Every Aspect of the Sound! 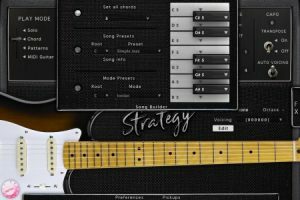 The solo mode is very simple, and is suited to play melodies. It uses a smart hand position system that decides for you where a real guitarist would put his hand and which string he would play. 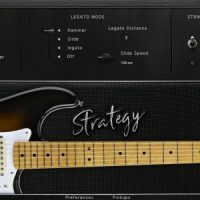 The Strategy also features Acoustic Samples’ powerful legato engine that will automatically trigger legato, hammer ons, pull offs, or slides and the legato distance will define the maximum interval in which the legato will apply. You also have access to key switches to play palm mutes, harmonics (flageolets) or even percussion sounds and control the legato engine. The legato mode controls which sample will be triggered when you play legato notes on your keyboard, for example press C2 and then C#2 without depressing C2. Hammer on and pull-off samples will be triggered. Slide will trigger slide up and slide down samples. 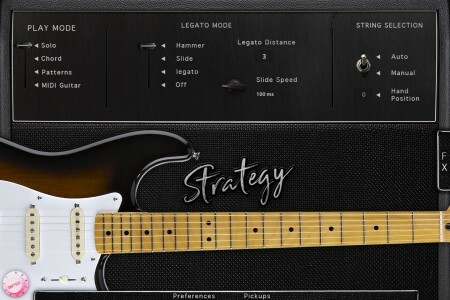 Legato will trigger regular sustain samples but will still stop the first played note. Off deactivates the legato function. The legato distance controls the interval in which the legato function is active. The slide speed is active only when the Slide legato mode is selected and controls the speed of the slide. The string selection enables the automatic string and fret selection or constrains the hand to the first position or the position of your choice. The most popular FX associated with a strat guitar are available, Chorus, Phaser, Flanger, Wah (manual and automatic), Tremolo, Delay, Rotary speaker, Tube saturation, tone stack, spring reverb, and a set of 8 known amps with different mic settings. You have everything you need to tweak the sound to your preferences and we included some presets to get you started. The 3 pickups (neck, middle and bridge) were recorded separately allowing you to use the built in 5 positions switch or to even use them all at the same time with different volumes. 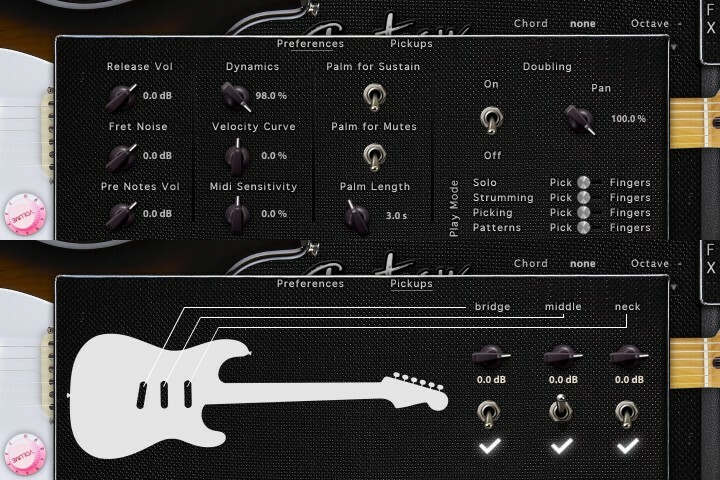 On top of this, you can use the doubling feature that allows you to play two guitars at the same time. For each playing mode, you can decide if you want to play with a pick or with fingers. In the preferences panel, every aspect of the library can be tweaked, the release, fret and pre-notes volumes, as well as the midi response of your keyboard. 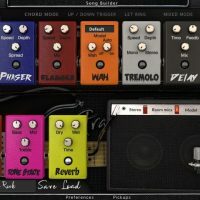 If you own a MIDI guitar and want to expand it’s sound capabilities, then the MIDI mode is for you, all you need to do is select the 7 different MIDI channels your guitar outputs and you are ready to play. 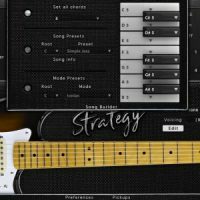 The MIDI guitar mode allows you to play Strategy using a midi guitar controller, all you need to do is select the 6 midi channels. You maybe have to use the set patch as omni to allow the plugin to respond to all midi channels. So What Exactly Can I Do With “Strategy Guitar”? “Strategy Guitar” is unparalleled in it’s flexibility and customisation options, offering you everything you need to mould it’s sound to your unique playing style; from user customisable strumming, picking and chord patterns to the unique Song Builder and MIDI Guitar control options. Note: iLok copy protection, but an iLok dongle is NOT required! Normally €130 – get it at 50% off before it’s gone! 50% off the normal price (normally €130)! 10.61Gb uncompressed, 1.97Gb compressed in lossless flac format, around 17300 samples. 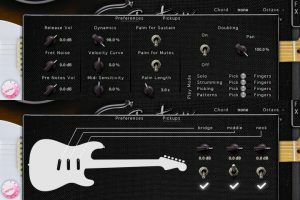 Strumming engine (features chord recognition and a smart strumming technique to produce guitar-like chords) and complete control of all its parameters. 68 realistic patterns for easy strumming, picking and advanced playing styles. Integrated song builder to create songs within minutes and very easily. Integrated pattern builder to automatically strum your chords. Legato script to play natural hammer ons, pull offs and slides. Natural automatic hand placement simulation. 53 different samples per fret and all 21 fret sampled for each string. Multi velocity Hammer on, pull off, slides up, slides down, mutes, palm mutes, pre notes. Control over the three single coil pickup volumes (bridge, middle and neck). Advanced bend and vibrato control. iLok NOT required! License on your computer or iLok key! Perfect for Rock, Pop, Funk, Country, Underscore and much more!